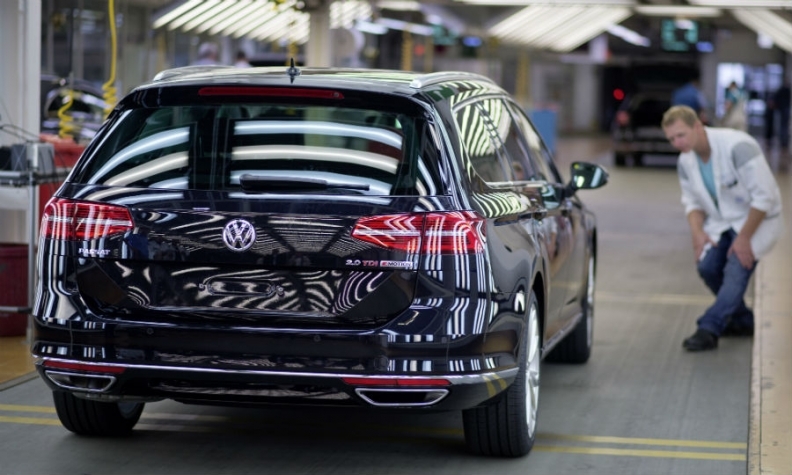 A VW Passat wagon is checked after coming off the production line at Emden. Weekend production was suspended. MUNICH -- Volkswagen halted production at a German factory that builds Passats and at its main gearbox plant as the automaker grapples with reduced demand and technical problems. VW suspended output at its Emden factory in northwest Germany on Friday due to technical problems at the stamping plant. The factory builds the Passat sedan, coupe and station wagons. Production at Emden may remain shut on Monday, Reuters reported. The plant employs about 9,600 people. VW also halted production in some areas of its factory in Kassel, central Germany, on Friday, with 400 workers affected. Kassel produces more than 4 million gearboxes a year and makes body parts for the Passat. Output at Kassel is affected by slower demand for components and technical problems at the Emden stamping plant, a factory spokesman said, confirming a report in regional newspaper Hessische Niedersaechsische Allgemeine. Kassel will halt production in some areas on Feb. 1, Feb. 5 and Feb. 8, the spokesman told Reuters. Kassel employs about 16,000 people. VW has said it is bracing for tough markets this year after suffering the first drop in sales of its core namesake brand in more than a decade in 2015 as it battles to contain the damage from its emissions scandal.